Ethiopia is a large country of 1,100,000 sq km with 70 million people, making it the tenth largest country in the Horn of Africa and the 27th in the world. Flying into Addis Ababa , the capital, one can see the lush and green landscape, making it hard to believe that in the 1980’s so many people died from hunger. Before travelling to Ethiopia the Center for Disease Control advised all Americans to get a tetanus shot, Hepatitis A and Hepatitis B vaccinations. Because I will be flying to Kenya from Ethiopia , a malaria treatment is recommended, and the Kenyan government requires a mandatory yellow fever vaccination. The cost of all these shots or vaccinations is very expensive, almost US$500. The next thing I did was to exchange my US currency for the Ethiopian Birr. Before leaving the US the exchange rate was 9 Birr to US$1.00. I made a wise decision to do my exchange at the airport because the rate was now 12.45 Birr to US$1.00. There are not many ATM’s in Ethiopia and only few places (hotels and resorts) accept credit cards, so I made sure to exchange enough for a few weeks. The only places in town you can exchange US currency are the Dashen Bank branches and they do not accept any bills made before 1996 (don’t ask me why, maybe counterfeiting problems). I was told by my driver that the Hilton Hotel also exchanges US currency and you can also withdraw cash from your debit card or your credit card. In no time at all I was at my hotel, checked in, took a quick hot shower and ready was for bed. I needed a good night’s sleep to get acclimated to the time difference and the altitude. Addis Ababa is about 7000 to 8000 feet above sea level. Tomorrow morning my step-daughter will be flying in and we have a big schedule ahead of us. I’m off to bed!! Wow Linda thanks for the update. You are such a good writer. You make us feel like we are there with you. Thanks for the detailed account. 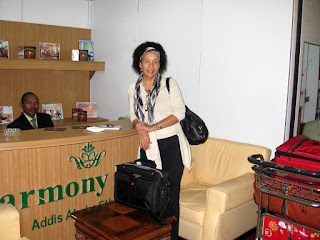 Wish you much luck and enjoyment in Ethiopia. Thanks Therese, Ethiopia is great! I wish I could update some more, but the internet is not on par with America; its dial-up and painfully slow, plus $8. an hour. I will be leaving to Kenya from here soon and I was told that it's much faster there.